Until very recently, porridge was an old-fashioned something you made with oats and water and a pinch of salt. And if you were a Scot, that was it. If you were from south of the border you might have added milk or cream, sugar and possibly a sliced banana, but that was as wild as it got. But porridge wildness is now widespread and, as Sheila Dillon discovered on The Food Programme, it comes in many exotic guises. 1. For extra crunch, try adding spelt flakes or using jumbo oats which have not been soaked overnight. Deliciously chewy! 3. Eat it the way the Scots recommend: standing up. The old custom says this helps digestion. But then custom also recommends stirring it anti-clockwise to stop the devil getting in! 4. Eat it with a wooden spoon or a horn spoon (a spoon made from a cow's horn) to avoid burning your mouth. 5. Think outside the box with your ingredients. You could add a dram of whisky for a winter warmer! Whichever way you eat it, eat it often. Porridge is healthy, as proven by a large US study. If you make porridge a regular part of your diet, you'll lower your risk of heart disease and diabetes. There are porridge restaurants! In The Food Programme presenter Sheila Dillon went to one and had Egg and Spinach porridge. Also on offer was a Hazelnut and Butter porridge which, along with the obvious, was made with almond milk, cinnamon, coconut palm sugar and apple, plus a sprinkling of flower petals. Here are three recipes for ways to really spice up your porridge experiences. Musician and chef Levi Roots has produced a sweet risotto porridge with bay leaves, vanilla, nutmeg and coconut milk. Top Danish chef Trine Hahnemann uses rye, spelt and oat flakes with apples, almonds and raisins to make a perfect Scandinavian bowl of comfort. And Shirley Spear, doyenne of Scottish chefs, makes it pure and simple: oats, water and salt — and showed us all what simple perfection means. This rustic recipe serves two for either a morning or an evening meal. Put the flakes, water, apple, almonds and raisins in a small saucepan, bring to a boil and lower the heat and let them simmer for 12-15 minutes, stirring frequently, then add the salt and serve right away, with cold milk if you like. Put the water in the pan in which you want to cook your porridge. Add the spices and bay leaf and bring to a simmer. Stir in the coconut milk and add the salt. Add the porridge oats to the fragrant spiced liquid, bring to the boil and then turn down the heat to a gentle simmer for 5-10 minutes, stirring often. Personally, I don’t like porridge too stiff, I like to make sure it can still move around the pan, adding more coconut milk or water if necessary. Spoon your porridge into bowls and add whatever takes your fancy. I like my porridge sweet so add a bit of condensed milk. Which Bob Marley song has a verse about cooking porridge? 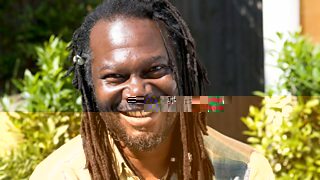 Chef Levi Roots sings some Bob Marley as he prepares his favourite Jamaican porridge. "The habit of making porridge with milk in the microwave is all wrong in my opinion and stems from the era of 'Ready-Brek'," says Shirley Spear. "There are die-hards who will never make porridge without steeping oatmeal in water overnight before cooking it in the morning in customary style and serving it piping hot with a bowl of cream or fresh, cold milk on the side. The skill comes with knowing exactly when to add the salt, which should be done part-way through the cooking process." Place the oats and water in a saucepan. Place over a medium heat and bring slowly to the boil, stirring from time to time. Once it comes to the boil and is starting to thicken, reduce heat to the lowest simmer, add the salt and cover the saucepan with a lid. For more forays into the world of porridge, listen to The Food Programme.